Because my Honors students are working under the Flipped Classroom, my normal 5pt pop quizzes are tough to give because not everyone is at the same point. In fact, between my 26 students there are usually 6-7 different activities on any given day. So, I make the questions a little harder and allow the students to take the quizzes whenever they feel ready. I put a few on there this time that really made them think and some students got stuck so they turned to the person next to them. Because there are multiple versions of the quiz (same questions, but different numbers), it is harder to directly copy the person next to you. What my students did was ask how to do the problem and then calculated it on their own. In the end, they had a higher grade and a little better understanding of the question. Now, it’s a 5pt quiz grade, the lowest 2 I drop at the end of the marking period. It would probably have made maybe a 0.1% difference in the grade. But, what happened is a great demonstration of what teenagers do: when faced with the possibility of scoring a low grade (and potentially looking dumb) they turned to cheating. Is that an acceptable behavior? No. Well, yes. Ok, maybe. In reality, it matters not why they are cheating, but what they are getting out of it. 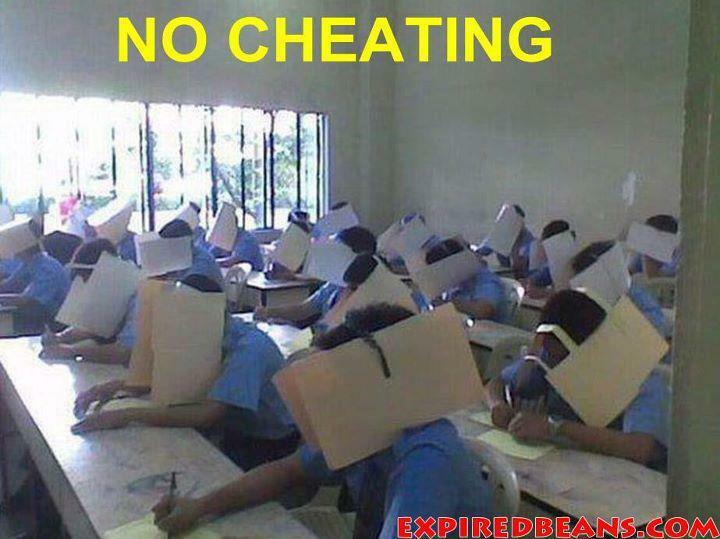 Most of the time when we think of cheating, we immediately jump to the idea that they are doing it to get a better grade. And, while that may be the case most of the time, here the students were doing it to get a better understanding of how to solve the question. I know this because I stared at them the entire time they were doing it and they never noticed. They asked each other questions back and forth until both were satisfied with their answers and then went to get it graded. They both earned perfect scores. In his speech about changing education paradigms, Sir Ken Robinson mentions that in school this is called cheating, but in the workplace it is collaboration. If this had been a lab, I would have scolded the students for not collaborating with each other. But, because it is a quiz, I am supposed to punish them with a zero. What is the real difference between these two assignments? If they are both checking for understanding, shouldn’t they be treated equally? When this happens again (because we all know it will) will I stop it? Yes….No….Maybe. Honestly, I don’t know. If I stop this, then shouldn’t I stop answering questions during tests? Clearly the test is not a measurement of the understanding of the material, but how quickly you can figure out the answers on your own with no help. I think I have just brought up more questions than I have answers for. Maybe I should go ask for help. Wait, would that be cheating collaborating whatever you want to call it? This entry was posted in cheating, educational paradigms, flipped classroom, ken robinson on November 22, 2011 by DaretoChem. Marc, this is a great post. I actually e mailed Aaron about letting kids work together on the final exam under the same thought process as you're having. I try and try to get myself out of the way, yet I still give (in some cases) cookie-cutter quizzes and questions that don't push for higher-level thinking. Maybe I'm afraid of the grades they'll get? I don't know. Anyways, I already have open-internet tests…I might start allowing them to talk to one another more during assessments. They collaborate all the time in class and they learn from each other, so why not work together on their demonstrations? It seems like a logical progression to me. I'm glad I'm not the only one having these thoughts.